Kunstforeningen, Copenhagen, Vilhelm Hammershøi 1864-1916, 1955, no. 52. Ordrupgaard, Charlottenlund, Hammershøi. Retrospektiv udstilling, 1981, no. 39, ill., p. 70. Wildenstein, New York, Hammershøi. Painter of Stillness and Light, 1983, no. 25. The Philips Collection, Washington, Hammershøi. Painter of Stillness and Light, 1983, no. 25. Poul Vad, (translated by Kenneth Tindall), Vilhelm Hammershøi and Danish Art at the Turn of the Century, New Haven/London 1992, ill., p. 102. Poul Vad, Vilhelm Hammershøi. Værk og liv, 2003, ill. p. 131. After his marriage with Ida Ilsted, Vilhelm Hammershøi and his wife travelled to Paris. They started their journey on 5 September 1891, and arrived on 21 September 1891 passing through Holland and Belgium. Upon his arrival, Hammershøi soon visited Théodore Duret, whom he had met in Copenhagen earlier in 1890. Duret was keenly interested in Hammershøi’s art. On his initiative Durand-Ruel also got knowledge about the artist through a portrait of Ida which was sent to him after the exhibition in Munich in 18911. During his Parisian sojourn Hammershøi executed two paintings2: An Archaic Greek Relief after an antique relief in Louvre3 and a Double portrait of the Artist and his Wife4 [fig. 1]. The present self-portrait by Vilhelm Hammershøi is presumably a preliminary work for this picture. Another drawing related to this painting is in a private collection [fig. 2]. 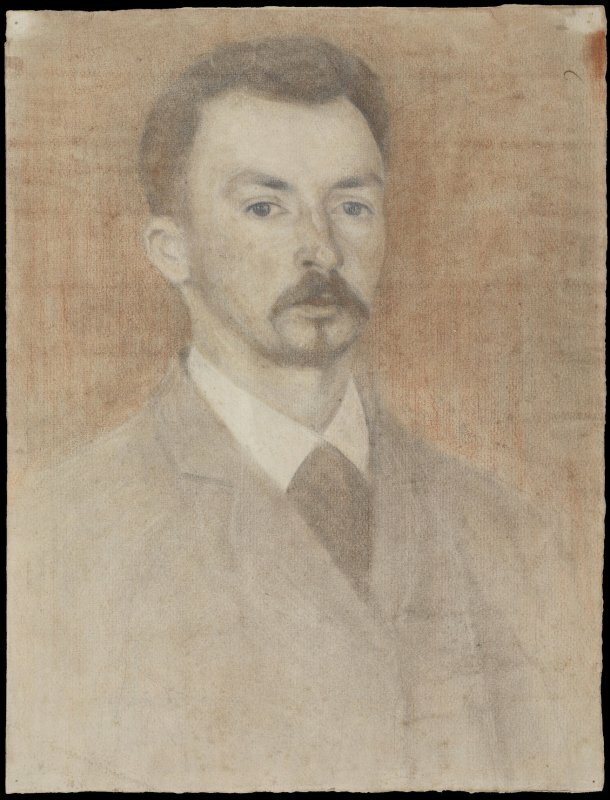 It might have been used for another painted Self-Portrait as well which also can be dated to 18915. Like in many of his earlier self-portraits the artist was not so much interested in physiognomic perfection. He mainly was trying to depict his reflection showing himself withdrawn and almost absent6. Aside from our drawing and the two double portraits, only three other self-portraits by the artist are known.